Tamago is something that probably doesn’t sound super familiar to you, unless you’re a foodie. “Non-foodies” might be thinking of Tamagotchi. Remember those handheld digital pet devices that all the kids were obsessed with in the 90’s? Although the name is familiar, we aren’t talking about that. We’re talking about eggs here, and that’s exactly what Tamago is. The word “Tamago” actually means “egg” in Japanese, or “Tamagoyaki,” a Japanese omelet dish. It is a basic staple in Japan. In fact, Japanese people eat this dish several ways – in the morning for breakfast or as a complementary ingredient in their bento boxes or sushi. If you go to your local sushi restaurant, you should be able to find Tamago either on or over sushi rice (nigiri). This dish can be both similar and different to the traditional American omelet. It is created by beating eggs inside a bowl and pouring the mixture into a nonstick skillet pan, similar to the omelet that you might be familiar with. It can also be seasoned in different ways, also similar to how American omelets can have several ingredients added to it. Some of the popular ingredients to mix with these eggs include dashi (a type of Japanese stock made from dried kelp), bonito flakes, soy sauce, sugar, rice vinegar and even sake. 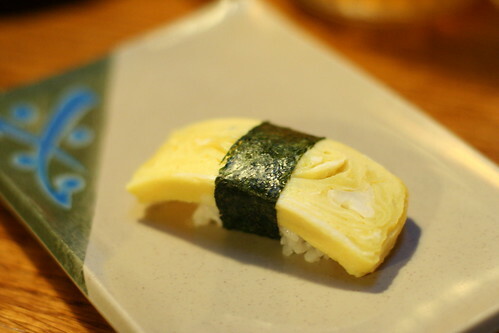 However, the number of times the Tamago is folded exceeds the typical American omelet. Folding the cooking egg multiple times creates several thin layers, turning the end product into something that looks like little bars of gold. To make this job easier, many people use special pans. These pans are different from the ones you would typically see since they are shaped like a rectangle. 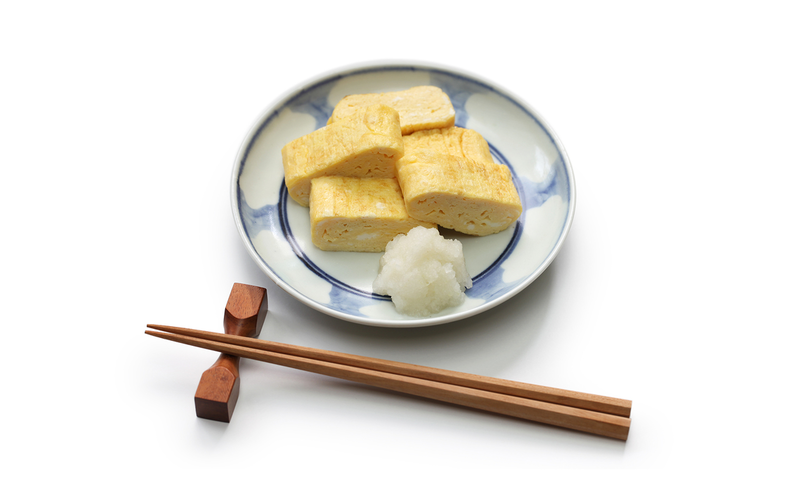 Using a “Kotobuki Tamagoyaki Japanese Pan,” will help you achieve the classic Tamagoyaki shape: a thick rectangular log. The traditional Tamagoyaki pan is made out of copper, and it’s easier to fold the eggs and create layers. 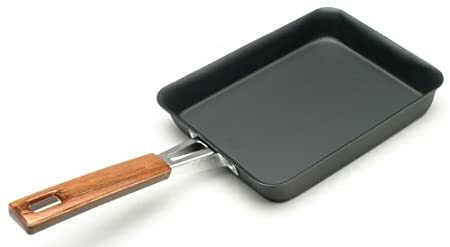 Like most good kitchenware, finding a good Tamagoyaki pan can get pricey. Luckily, we have a “Tamagoyaki hack” you can use at home. 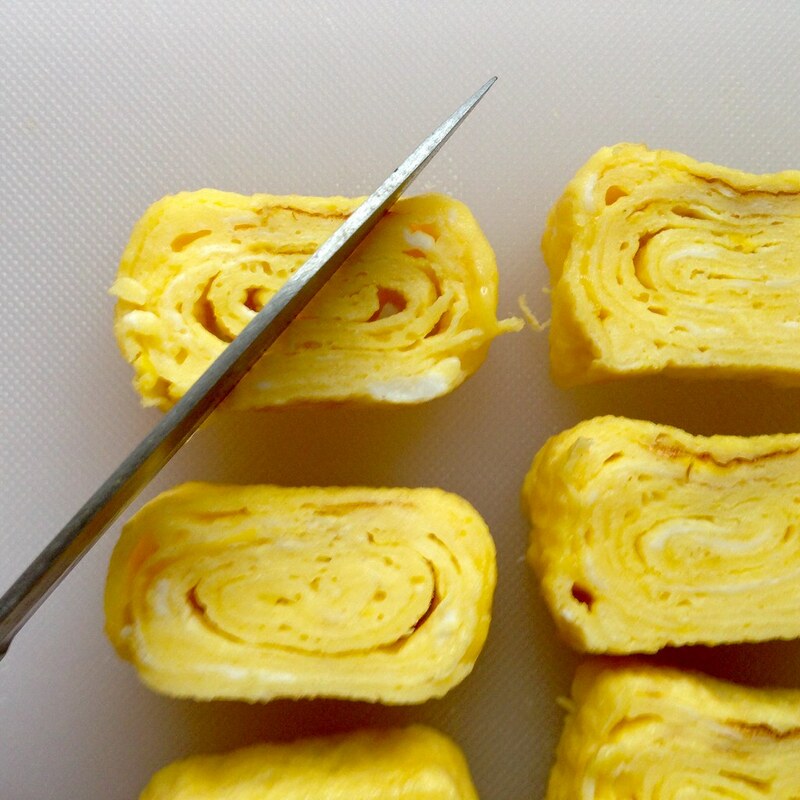 You can use a round nonstick pan, and trim the edges to form the traditional Tamagoyaki shape! Tamago can be found at many local restaurants, in fact, let us tell you how we use Tamago here at Ejji. 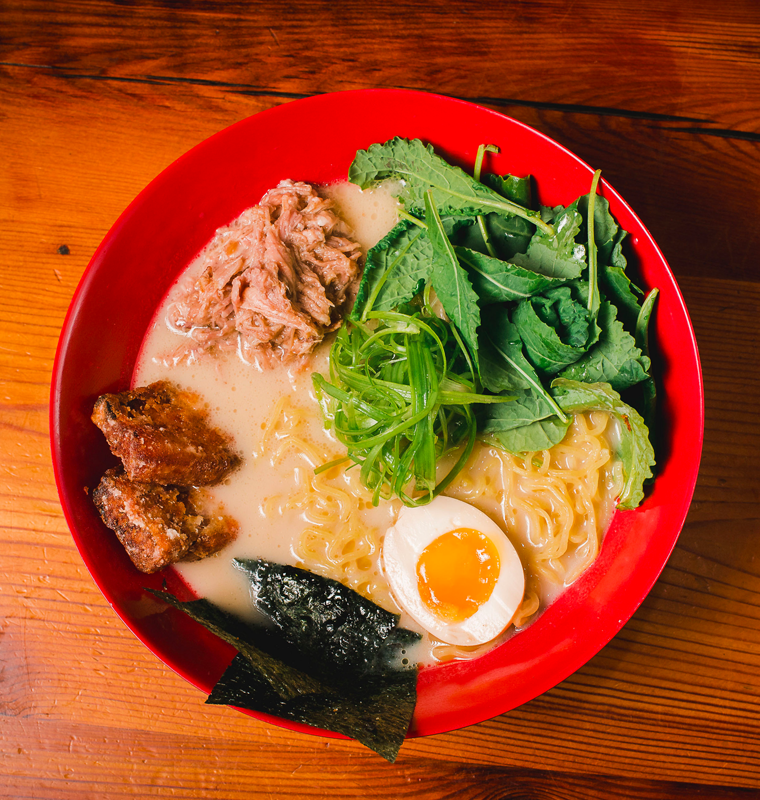 We offer a special Breakfast Ramen Bowl on Saturday and Sundays for brunch from 10 a.m. to 5 p.m. 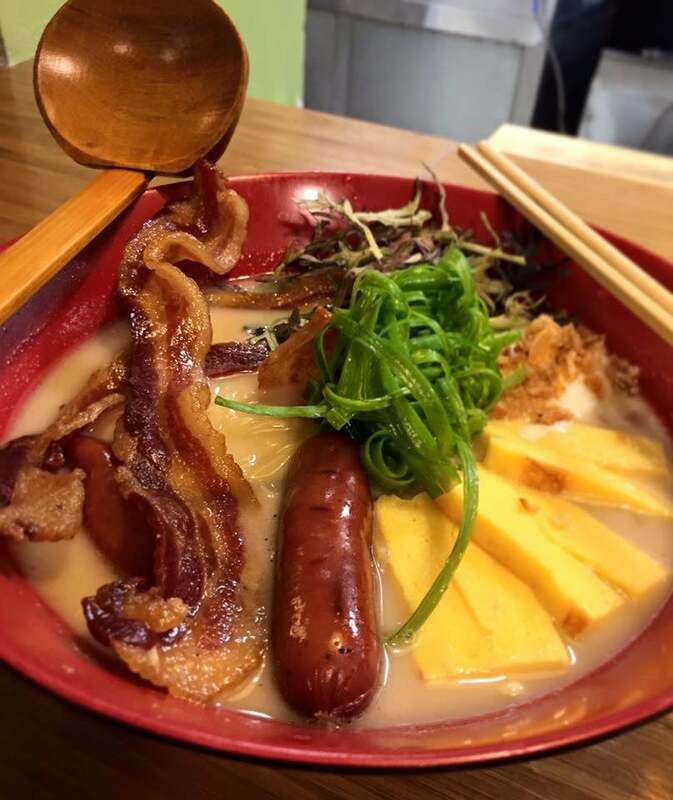 This delicious bowl includes ramen in a bacon-corn broth with Kurobuta pork sausage, applewood bacon, poached egg, fresh corn and… Tamago. The Tamago adds a slightly sweet note and interesting texture to the dish. Make sure you try it next time you come in!